Ever since I devised the recipe for Apple-Pecan Spring Greens with Maple-Dijon Vinaigrette, we have eaten that salad a lot! I initially made it to mimic a restaurant salad that my dad really enjoyed and have become quite a fan, myself. The addition of Spiced Pecans makes me really swoon! When a friend told me that she had been making this salad often for her family and had used the dressing on roasted vegetables, I thought that was simply genius! I tried it immediately and particularly love it on orange root vegetables. 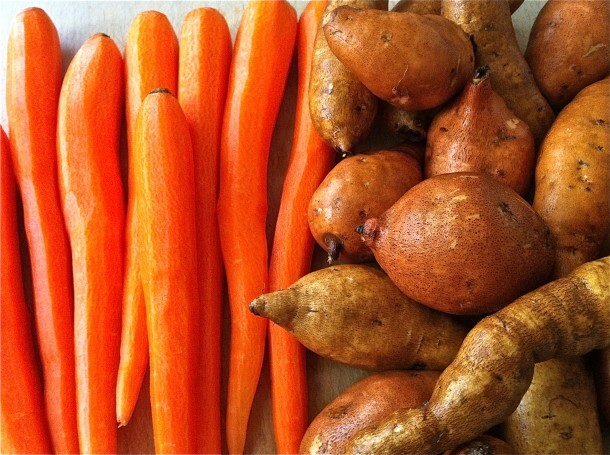 This recipe specifies sweet potatoes and carrots, although you could add other vegetables as desired. Beets, parsnips, onions, turnips–even brussel sprouts would all be well suited. Soon, I will share a new rendition of the Maple-Dijon Dressing–a creamy option. 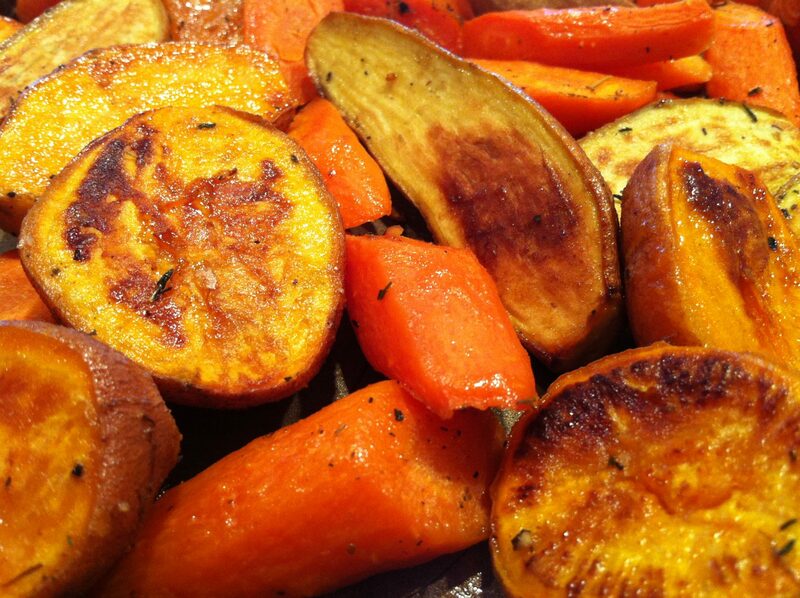 I tested the roasted vegetables with this version, too, and it worked perfectly. In a small bowl or jar, combine the olive oil, maple syrup, vinegar, Dijon, salt and pepper. Mix well. The dressing can be made in advance and will store, tightly sealed, a week or more in the refrigerator. Cut vegetables into 1-2 inch chunks and toss with vinaigrette to coat lightly. Spread evenly over a greased baking sheet and bake in a 425-degree oven for 20-25 minutes or until golden brown. I like to spread the vegetables on the baking sheet so the flat, cut sides are facing down. This will allow maximum surface area to be against the metal sheet and create optimal browning. I came to the site because I saw the parmesan potato recipe in the Sunday newspaper….. and had turnips I also needed to use up. So, I did a search to see if there was a turnip recipe on this site. And here it is! I am so glad that you found this recipe. This is a great dressing for the Apple Pecan Spring Greens Salad, too! I did find I had to turn the heat down….at 400 my oil started to smoke. I was OK at 375. Probably had to do with the fact I was using extra virgin olive oil. Thank you for your comment, Christine. It was likely the lower smoke point of that oil. When you say “Mix of…” how much are you suggesting? Hi Leah, This will be enough to coat one baking sheet-full of vegetables, spread into a single layer, or about 2 pounds.